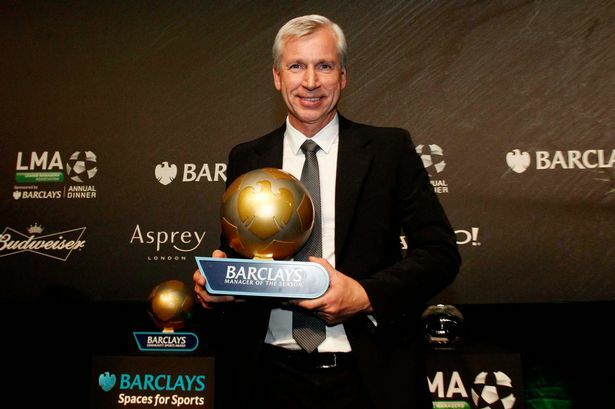 Home » Awards , EPL » EPL Managers of the Season since 1993, Where are they now? EPL Managers of the Season since 1993, Where are they now? Another gem from Reddit's "OneSlyPanda", this time taking a look at managers that have won the award of best bench-boss in the EPL since 1993. Whether you think he’s the devil himself or the messiah reincarnated as a wine-loving, gum-chewing Scot from Glasgow, it’s hard to be surprised that Fergie has been crowned the best manager in the League a whopping eleven times. Arriving in Manchester in 1986 from Aberdeen, Ferguson went on to oversee Manchester United’s dominance of English football until his retirement in 2013. His teams were renowned for their ability to play beautiful, expansive football whilst also being able to grind out 1-0 wins—usually won in the last seconds of extra time. Season upon season of success resulted in a knighthood, a statue, the renaming of a stand in his honour, and the term “squeaky-bum time” entering the Oxford English dictionary. In 2014, Ferguson became a UEFA Coaching Ambassador and took up a teaching position at Harvard University. Hated by opposition fans and revered by the Old Trafford faithful, he is undoubtedly an icon of the game—no matter how you look at it. Managerial silverware: 2 Champions Leagues, 13 Premier League titles, 5 FA Cups, 4 League Cups, 10 Community Shields, 1 Cup Winners’ Cup, 1 Super Cup, 1 Intercontinental Cup, 1 Club World Cup. 1994 was a very different time to be a Blackburn fan—rather than flag-wearing chickens, it was Alan Shearer running amok on the pitch, overseen by Kenny Dalglish. Dalglish took the Blackburn job in 1991, taking Rovers to the Premier League through the play-offs in his first season. The following season, Blackburn’s first in the top flight since 1966, Dalglish steered Rovers to fourth. In the 93/94 season, Rovers finished second, losing out to—who else—Ferguson’s Manchester United. There was to be no such heartbreak the next season, however, with Rovers snatching both the title and Manager of the Season award from United and Ferguson by a mere point. Dalglish never won Manager of the Season again, but that didn’t mean his career wasn’t successful. Before the Blackburn job, he had already won the league three times with Liverpool, lifted two FA Cups, a Super Cup, and four Charity Shields. Sadly, none of this was enough for him to win the LMA Manager of the Season and, as there was no Premier League until 1992, there was no Premier League Manager of the Season award for him to win. After Blackburn, Dalglish went on to have a topsy-turvy stint at Newcastle in 1997, finishing second and then thirteenth. In 1999 he was hired as Director of Football and Head Coach at Celtic, which ended with a Scottish League Cup win and a legal battle with the club. In 2009, Dalglish returned to Liverpool as a youth coach and eventually returned as manager after the departure of Rafael Benítez. He would lead Liverpool to their first trophy in six years (the 11/12 League Cup) before being sacked by the club in 2012. He now works as a non-executive director at Liverpool, amongst other things. Arsène Wenger, aka “Le Professeur,” is the second of three men to have won the award more than once. Wenger is best known for dedication to his philosophy of attacking football and youth, masterminding “The Invincibles” squad of 2003/04, and his incredible use of black magic to consistently achieve Champions League football during a perpetual injury crisis. Wenger joined Arsenal in 1996 from Japanese side Nagoya Grampus and is currently the longest-serving manager in the Premier League, and the most successful in Arsenal’s history. Although it has become somewhat of an Internet joke, under Wenger’s management Arsenal have never finished below fourth in the league, a consistency other clubs only dare to dream of. Wenger’s first decade at Arsenal was extremely fruitful, bringing with it three Premier League titles, four FA Cups, and Thierry Henry, among other things. It also led to “The Invincibles” squad as Arsenal became the second team in history to go an entire league campaign unbeaten, a feat last achieved by Preston North End in the 1888/89 season. It is hardly surprising then that his three Manager of the Season awards came during this spell of his career. The construction of the Emirates Stadium in 2006 led to a barren run of nine years without any new silverware in the Arsenal trophy cabinet—unless you count the Emirates Cup, of course. Although an FA Cup win in 2014 suggests a slight resurgence in form, a seeming unwillingness to mount a serious title challenge or progress any further than the round of 16 in the Champions League has led a growing number of Arsenal fans to ask if it’s not time for Wenger to move on. Currently, Wenger has a contract with Arsenal that will keep him at the club until 2017. What happens after that is anyone’s guess. Wenger will be 68 and may be looking to retire, or, if rumour has it, manage the French national side. But it would be foolish to presume anything; as we all know, it doesn’t take long for things to change in football. Remarkable in a number of ways, the fifth place finish and UEFA Cup qualification of George Burley’s Ipswich Town in 2001 was enough to make him the first manager to win Manager of the Season without actually winning the league. In fact, Burley was the first manager to win the award without having won any previous silverware at all. Sadly for him, Burley would never go on to lift a trophy. After three seasons of trying under Burley, Ipswich were finally promoted to the Premier League after their fourth successive time in the playoffs. Burley went on to take Ipswich to within three points of Champions League football, and a higher league finish than Chelsea, Tottenham, and Manchester City (who were in fact relegated that season). Despite the phenomenal achievements of the 2000/01 season, the burden of European football put a strain on Ipswich’s league form during the 2001/02 campaign. The club finished eighteenth, was relegated, and after Burley terminated his contract by mutual agreement at the end of 2002, managerless. Since then, Burley has gone on to manage Derby, Southampton, Crystal Palace, and the Scottish national team, but he never quite managed to recreate the success he achieved at the start of the millennium. Burley’s last foray into management was a brief spell in charge of Cypriot side Apollon Limassol in 2012—and in this case brief means virtually non-existent. Burley lasted a whole two games in charge before a disagreement with the Sporting Director over style of play led to his dismissal. Burley is currently not managing, but after his last experience you can see why he might fancy taking a break. Arriving at Chelsea in 2004, and immediately proclaiming himself as “a special one,” Mourinho went on to win back to back titles, while being voted Manager of the Season twice in the process. Despite such phenomenal success, the following seasons were marred by rumors of behind the scenes disagreements with Roman Abramovich over the running of the club that culminated in Mourinho’s departure from Chelsea in 2007. Although club and manager had parted, success stayed with them both. Mourinho went on to manage Internazionale in Italy, winning the treble for the first time in Italian football history, and beating Chelsea on his way to lifting the Champions League. After this, Mourinho moved to Real Madrid and again success and controversy followed. Despite successes best highlighted by the record breaking 2011/12 season where Madrid finished with the highest goal difference, goals scored, and games won in La Liga history, Mourinho’s time at Madrid was marred by outbursts that eventually culminated in him poking Barcelona manager Tito Villanova in the eye and a rumoured dressing room coup that saw him eventually leave the club. In the time after Mourinho’s departure, Chelsea had cycled through no less than eight managers in search of a fitting replacement, winning both the Premier League and the Champions League along with other silverware along the way. Eventually, in 2013, Mourinho re-joined Chelsea, suggesting that previous misgivings about the running of the club had been settled. Since his return, Mourinho has won the League Cup and 2014/15 Premier League and is contracted to the club until 2017. Managerial silverware: 3 Premier League titles, 1 FA Cup, 3 League Cups, 1 Community Shield, 1 La Liga title, 1 Copa del Rey, 1 Supercopa de Espana, 2 Serie A titles, 1 Coppa Italia, 1 Supercoppa Italiana, 2 Primeria Liga titles, 1 Taca de Portugal, 1 Supertaca Candido de Oliveira, 2 Champions Leagues, 1 UEFA Cup. Some say he’s a top, top manager with a terrific record, others that he’s nothing more than a wheeler dealer (much to his objection), and that his dog Rosie is the true mastermind behind his success. Arriving in Tottenham in 2008 after leading Portsmouth to their first FA Cup since 1939, Redknapp would take Tottenham to Champions League qualification in his first full year at the helm. This achievement meant Redknapp was voted the Manager of the Season for the 2009/10 season, somewhat surprisingly becoming the first Englishman to win the award. His next two years at the club were marked with similar success, finishing fifth and then fourth again, although Tottenham would miss out on Champions League football due to the unusual circumstances of Chelsea winning the Champions League but finishing outside the top four of the Premier League. Despite his continued success at Tottenham, Redknapp left the club in 2012 due to a breakdown in contract negotiations. Redknapp then took up managing the poisoned chalice of Queens Park Rangers, who were at the time rock bottom of the Premier League. Unsurprisingly, QPR were relegated at the end of the season, but Redknapp stayed on and saw them bounce straight back into the Premier League. The return was not a success and Redknapp left the club at the end of the 2015 January transfer window claiming a knee problem, although rumours suggest disagreements over transfer policy are what led to his resignation. Currently Redknapp is doing punditry work, but has expressed his desire to return to management one last time. Pardew took charge of Newcastle in late 2010 after the shock decision to sack fan-favourite manager Chris Hughton. So began one of the most tumultuous managerial stints in the Premier League. Disliked by a large portion of Newcastle fans for being seen to be a yes-man for Mike Ashley, Pardew still managed to oversee a campaign in the 2011/12 season that saw Newcastle flirt with Champions League qualification before eventually finishing fifth and securing European football for the first time since 2007. This success, made possible by the shrewd signing of cheap and talented French players, resulted in Pardew being voted Manager of the Season. The next few seasons were not as successful as the toll of European football, injuries, and tactical inconsistency saw Newcastle repeatedly flirt with relegation and the relationship between the fans, manager, and board sour even further. Eventually in 2015, after multiple fan protests over Pardew’s alienation of star players like Hatem Ben Arfa, and Ashley’s management of the club, Pardew left Newcastle for Crystal Palace where he is currently still manger. The most recent winner of the award, Tony Pulis was crowned best manager at the end of the 2013/14 season after saving the seemingly-doomed Crystal Palace from relegation and leading them to finish a respectable eleventh in the league. Pulis is the first Welshman to win the award, as well as the only manager to win the award without any managerial silverware to note (not including promotions due to finishing second). Pulis arrived at Crystal Palace after a second, seven-year spell as Stoke City manager that saw him lead Stoke to promotion from the Championship and cement their place as a Premier League regular. Stoke and Pulis eventually parted ways for the same reasons Crystal Palace hired him: Stoke had the desire to change from Pulis’ style of no-nonsense physical football. Pulis’ shrewd loan signings of players such as Tom Ince and Jason Puncheon led to Palace finding new life in the second half of the season, eventually finishing only two league places and five points behind Stoke. But it wasn't just Pulis’ brand of football that urged Stoke to move on. In his time at the club, Pulis had spent an incredible amount of money to secure mid-table finishes, a net spend of £120 million more than Arsene Wenger at Arsenal. This fact meant the Crystal Palace board were unwilling to give Pulis the freedom in the transfer market that he desired, a fact that caused him to leave the club at the end of the following transfer window. Pulis has been in charge at West Bromwich Albion since January 2015 and looks set to have secured Premier League football for another year. How much freedom West Brom are willing to give him in the transfer market remains to be seen.